Acer has announced the incredibly thin and light Swift 7 (SF714-52T) with a new premium chassis that liberates the display. Honoree of a CES 2019 Innovation Award, its ultra-narrow bezels make it virtually borderless, giving the 14-inch Swift 7 an impressive 92 percent screen-to-body ratio. Powered by Windows 10, it’s feather-light too, meaning traveling professionals who carry a notebook through the day will rejoice at its weight of just 890 grams — giving the Swift 7 an almost weightless feel when carrying it in a briefcase or small bag. Thanks to incredible design and engineering advances, the redesigned Swift 7 fits the latest tech into a chassis that is significantly smaller than its predecessor. It has a four-side narrow bezel design with bezels measuring just 2.57 mm[ii], dramatically reducing the width and depth of the notebook to just 317.9 mm W x 191.5 mm D (12.51 W x 7.53 D inches) for an immersive, almost full screen display. 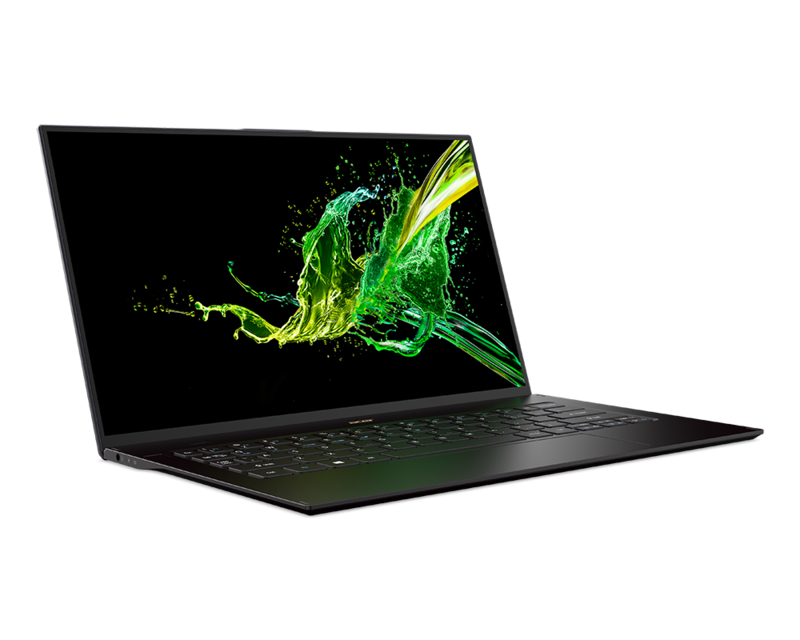 Like its predecessors, the Swift 7 (SF714-52T) remains incredibly thin and light, measuring under 1 cm thin at 9.95 mm (0.39 inches) and weighing less than 1 kg at just 890 grams (1.96 pounds). The 14-inch Full HD 1920x1080 touch display with IPS[iii] technology allows smooth touch interactions and presents vibrant and crystal-clear images. Featuring a 100% sRGB/72% NTSC color gamut and 300 nits of brightness, the Swift 7 brings immersive experiences through its advanced display. Plus, it’s extra durable thanks to a layer of Corning Gorilla Glass 6. The Swift 7 is powered by the latest 8th Gen Intel Core i7-8500Y processor to deliver top-notch performance for web browsing, productivity with presentations and spreadsheets, and even using compute intensive creator tools while enabling a fanless design. With up to 512GB of fast PCIe SSD storage, a large amount of files can be stored and quickly accessed, and with up to 16GB of LPDDR3 RAM, customers can multitask smoothly. And with 10 hours1 of battery life, customers can use their Swift 7 well into the evening. The Acer Swift 7 (SF714-52T) with a touch display will be available with 8GB or 16GB of LDDR3 RAM and either 256GB or 512GB of SSD PCIe storage. The new Swift 7 will be available in North America in May, starting at $1,699; in EMEA in April, starting at €1,799; and in April in China, starting at ¥14,999.